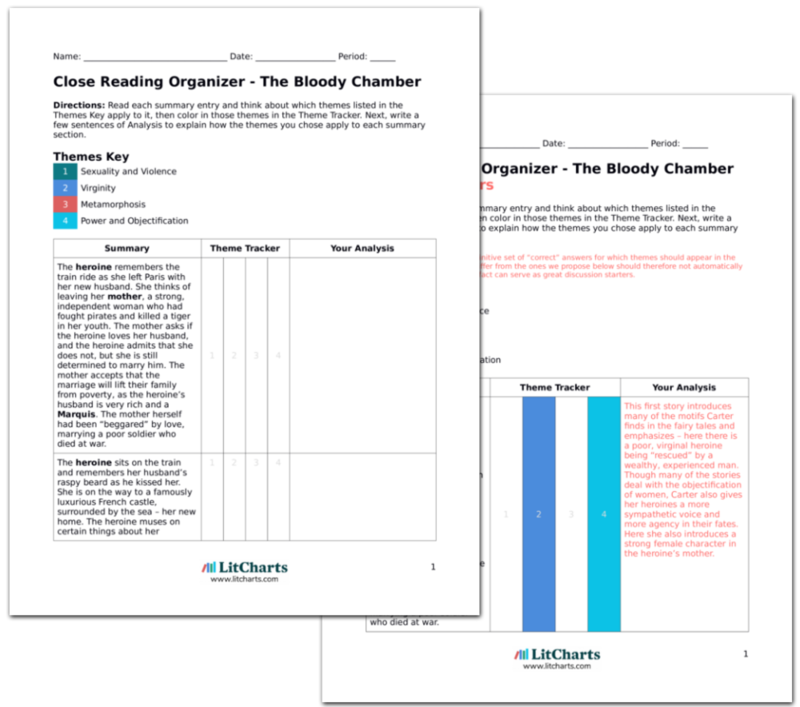 Instant downloads of all 946 LitChart PDFs (including The Bloody Chamber). The narrator describes a harsh Northern country, where the people living near the forest fear both wild beasts and monsters like vampires or the Devil. They are very suspicious, and stone an old woman for being followed too closely by her black cat. In this land lives a child, and her mother asks her to take some oatcakes to her grandmother, who has been sick. The grandmother lives five miles away through the forest, and the mother gives the child a knife and warns her not to leave the path. The child sets off. Carter now moves to fairy tales of Northern Europe, where the climate is harsher and the people more solemn. She introduces this new environment by telling tales of wolves. The wolf will be the “beast” of the final three tales, as Carter focuses on wolves that are “hairy on the inside” and live, like her other monsters, on a threshold between wildness and humanity. The child is a mountaineer’s daughter, and is experienced with the wild beasts and harsh country. When she hears a wolf howling she takes out her knife. The huge, red-eyed wolf attacks her but the child cuts off its hand and it runs off, whimpering. The child wraps the wolf’s paw in a cloth and keeps walking, and soon reaches her grandmother’s house. This story is based on “Little Red Riding Hood.” In this first version the child is still a virgin but has an independence and beast-fighting ability reminiscent of the heroine’s mother in “The Bloody Chamber.” She is no object, but has her own agency. The grandmother is the “beast” here, and her bedroom the “bloody chamber.” Though the child shows great agency and inherits the fortune as usual, the story also has a harsh, brutal tone as the child ruthlessly turns on her own grandmother. We never see the grandmother’s point of view, and whether she was helpless against her bestial desires. Cosby, Matt. "The Bloody Chamber The Werewolf." LitCharts. LitCharts LLC, 11 May 2014. Web. 25 Apr 2019. Cosby, Matt. "The Bloody Chamber The Werewolf." LitCharts LLC, May 11, 2014. 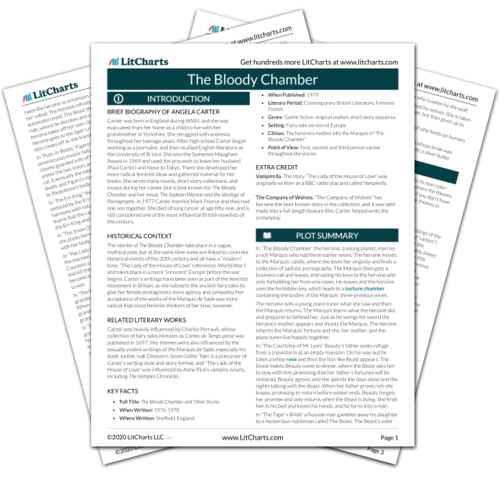 Retrieved April 25, 2019. https://www.litcharts.com/lit/the-bloody-chamber/the-werewolf.